The South Korean government says it is investigating whether abuses took place during clinical trials for stem cell treatments, which critics say exposed desperate patients to unacceptable risks. The government has been forced to rethink its hands-off approach to cutting-edge stem cell medicine following the fiasco over the cloning pioneer, Hwang Woo-suk, who was found to have fabricated research for his claimed breakthrough on cloned stem cells. South Korean scientists had also claimed a lead in the parallel field of adult and umbilical cord stem cells; and the government gave the go-ahead for laxly regulated clinical trials, which some scientists say should never have been allowed. "Stem cell science is still at a very early stage; this was really a blind trial," says Professor Lee Sang-ho of the Biotechnology School at Korea University. "The cells are like rugby balls: you don't know which way they will bounce. They could become cancerous or dormant, we simply don't know at this stage". Hwang Mi-sun, a 39-year-old paraplegic, was one of the first to receive an infusion of umbilical cord stem cells into her spine. At first, she reported dramatic improvements in her mobility; but after a second operation, she relapsed and now complains of severe pain. South Korean press reports say other patients have complained of complications, while some did report minor improvements. Professor Lee said none of the results had been submitted for peer review, and painstaking research on animal models should have been conducted before rushing to clinical trials. He was astonished to learn that some patients have been paying for what were supposed to be emergency trials. Kwon Soon-mo, who was paralysed two years ago with a spinal cord injury, says he was asked to pay 16,000,000 won ( $16,300; £9,000 ) for treatment. 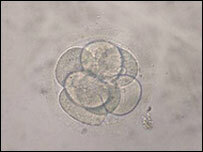 A private stem cell bank, Histostem, has been a pioneer of stem cell treatment in South Korea. It says it has treated 250 patients and claims limited success in some cases. The company president Dr Han Hoon says he hopes to provide commercial treatments within three years, but worries that the government is now tightening up its regulations. "I know many think this treatment is premature; and we are continuing our research. But many patients can't wait for treatment - and I question whether controls need to be so strict in those cases. "The stem cells come from infants and there can't be any danger." Sceptics say none of the claims of the stem cell companies have been proven - and far more clinical testing is needed. The government's role is coming under increasing scrutiny. It enthusiastically backed stem cell research, after identifying it as a potential industry of the future. Now, it has been stung by the backlash from the fraud over embryonic stem cells, and is reviewing its permissive approach to clinical trials. Critics say the government got carried away with public enthusiasm for stem cell treatments at a time when it was promoting Dr Hwang Woo-suk as a national hero. They argue that lax government regulation has been at the heart of the problem.